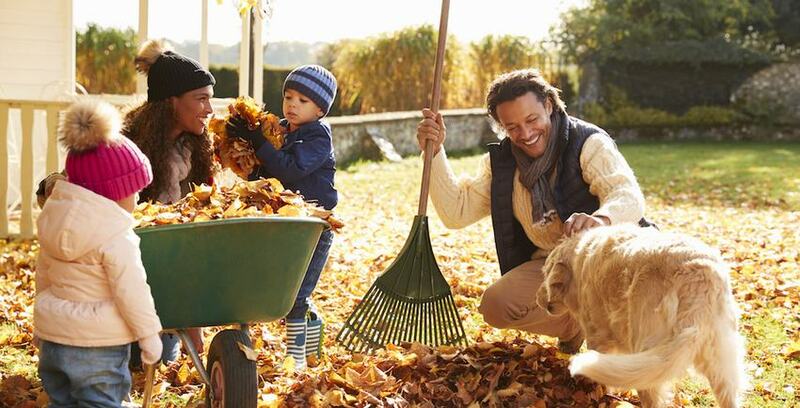 Raking leaves can easily be a very fun chore - we tell you how to properly rake leaves! If you rake leaves the wrong way, you're likely going to have further problems in the future. Knowing how to properly rake leaves includes this important tip: don't procrastinate!! There is nothing more aesthetically pleasing than the site of a beautiful, leaf-covered lawn in the Autumn. But don't be tempted to procrastinate by this gorgeous scene and cause yourself even more problems. The lawn will be smothered in a thick layer of unshredded leaves is left on top of them over the winter. An amateur move in the leaf clearing business is to forget about your gutters. Our next "how to" in the "how to properly rake leaves" list is to not forget your gutters. Having leaves in your gutters causes a variety of problems which can become very serious. Most notable of all is indoor flooding. If you live anywhere that gets rainwater and especially snow - you will need to have clear gutters in order to protect your home! Having leaves backed up in your gutters can lead to freezing and flooding inside and outside the home and that isn't a problem you want to be dealing with in a foot of snow in February! Has it been a long while since you last cleaned your gutters? A layer of dirt and debris may have built up over time. Blast it away with the fine-spray nozzle of your power washer. (This type of cleaning can get messy; be prepared to rinse the roof and exterior walls afterward.) For clogged downspouts in particular, there’s no better recourse than a power washer. Simply point the nozzle down the hole and rinse the shaft until the water can run freely through it. Consider installing a screen or barrier on top of your gutters to prevent leaves and debris from accumulating over the course of the year. Remember what they say about an ounce of prevention!" Finally, if you really want to know how to properly rake leaves you'll need an excellent rake. Don't skimp and get the cheap stuff. You'll want a good sturdy rake that is long enough to avoid bending over, wide enough to catch all the leaves and strong enough to not break and last year after year. "If you’re raking leaves, what you need is a leaf rake, also known as a lawn rake (view example on Amazon). Sold in varying widths (up to 30″), it has a long handle with tines that fan out in a triangle. The tines are generally made of either metal, plastic, or bamboo. Metal is the most resilient, but perhaps not quite as effective as plastic tines when moving large quantities of leaves, especially if they’re wet. Bamboo tines are the most fragile, of course, but are much gentler on plants, if you are raking over groundcovers or garden beds."